Here's to being two days into my last week before Spring Break begins! In all seriousness, I couldn't be more excited for a few days off of school to do boring things like clean the house & catch up on my Hulu shows. 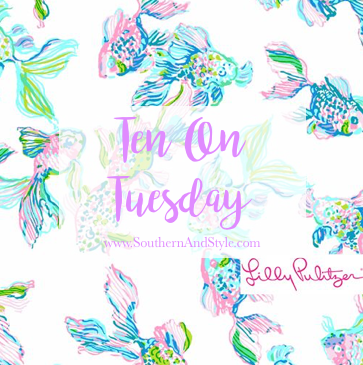 Without further adieu, let's jump into my Ten on Tuesday. I have seen so many of my favorite Vloggers on YouTube getting this palette sent to them in PR, and y'all I'm just dying over how pretty it is. They say it smells amazing too, so how could you not want it?! When I was shopping around for Lunch with Lilly last Saturday, I stumbled upon this bag and y'all-I need it for beach and lake trips this summer. From the pattern to the size...and then those tassels, it's just a must-have. One of my favorite ways to cook lately has been to grill, which I know seems odd since grilling is usually a "man-thing". But y'all, the meat comes out so much better & the clean up is so much less. I'm living for these warmer evenings we have coming up so I can cook a whole lot more outside! I recently stumbled upon Spotify's Women of Country playlist, because I love listening to music while I work on these blog posts & this song has become a serious favorite-I fell in love with these two from the beginning of Nashville! Some people check the news daily, but I check Good Housekeeping's website. They round up articles from all over the internet on topics like recipes, lifestyle, inspirational stories, DIY...basically everything! Y'all know my obsession with all things Southern...well this Southern Living article takes that obsession to a new level. 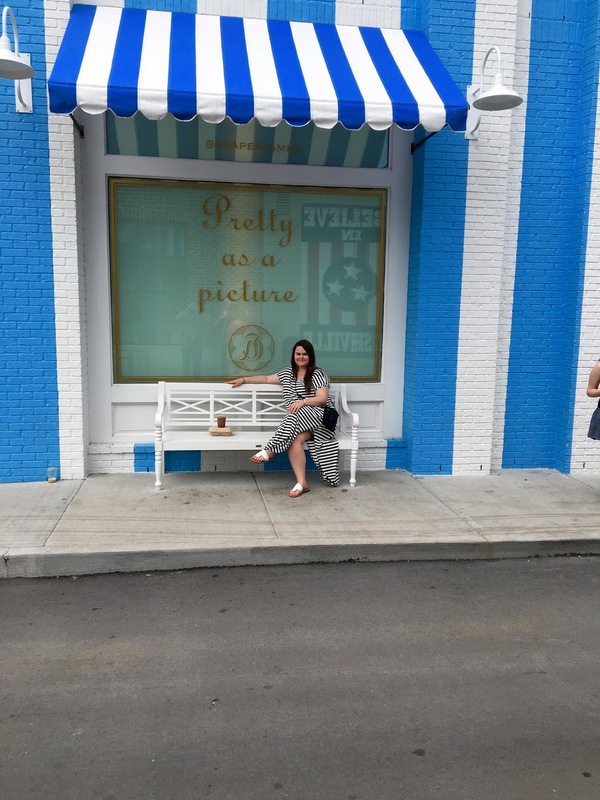 It covers all of the South's best shops-including a personal favorite of mine; Draper James in Nashville. Speaking of Nashville & 12 South, which is the neighborhood where Draper James is located, I was so sad to read this article last week about the "I Believe in Nashville" mural being vandalized. Apparently someone threw black tar on it and covered a good portion of the mural. Thankfully, they are planning to fix the mural because soon it will be the 5-year anniversary of the mural being there on the wall. It's literally right across the street from Draper James-I'm so thankful that they're going to be able to repair the mural! On Saturday, my husband and I went to the SLE Rodeo in Montgomery & had a great time! 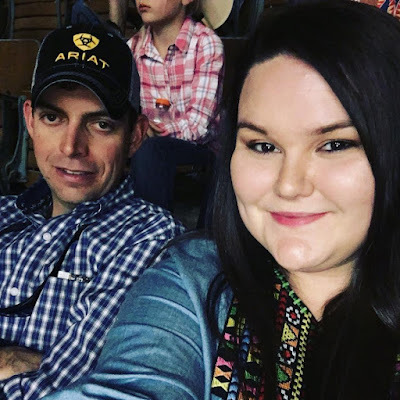 We've been going to this rodeo since we first started dating, so it's so much fun to see it year after year and get to see some of our friends that we don't see very often. The Kate Spade surprise sale ends tomorrow! I've picked out a few favorites for you. . .
Well, here's to the second edition of Ten on Tuesday! That sweat peach palette is beautiful! I have a picture in front of that same wall in Nashville! Love Nashville! 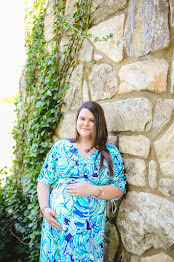 That Lilly Pulitzer bag is to die for. Love the colors! And grilling meat? Move over, guys, this girl needs her BBQ fix!! Looks so fun! I want to visit Nashville so bad! I live near 12 South and everyone is sad the mural was defaced. But the company who painted the mural had such a good attitude about it and it will be fixed soon! Loved reading this roundup! 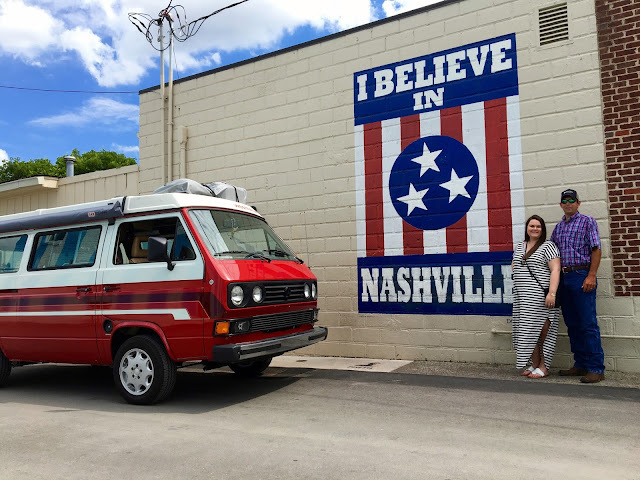 My friend has a picture in front of that same Nashville mural! I've never been to a rodeo! I wantto go! haha happy you guys had fun! LOVE this post so much! I reeeeaaaaallllly want a bar cart for our house! I love Kate Spade surprise sales! I love to grill as well! Can't wait for the weather to warm up more so we can grill more often. I love that palette as well! Great list! The Kate Spade sales were amazing indeed! And heading over to check out the good housekeeping website now, have a feeling I am going to be hooked too. Thanks for sharing!